Primrose House is located on the corner of Russell Avenue and Malua Street, in the southern suburb of Dolls Point. 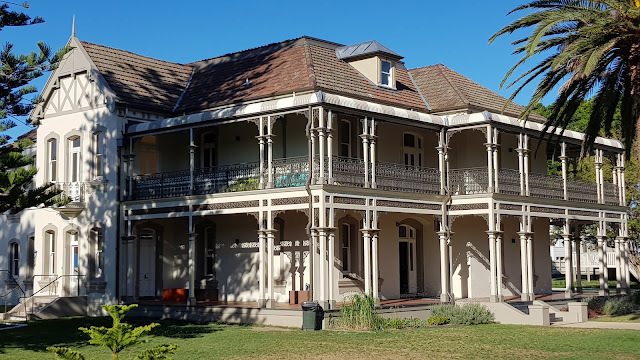 It was built in 1891 in the Victorian style and was originally the Scarborough Hotel at the Sans Souci Pleasure Grounds. It became a convalescent hospital for war wounded from 1913 and then bought by the charity Dr Barnardos Homes to house orphans and abandoned children. It was renamed after it was purchased by St George District Hospital in 1936, after chairman and solicitor Herman B. Primrose. It was used as an annex of the hospital until 1992 and then used as a day hospital for the frail and elderly. It was later restored and redeveloped and opened in 2018 as the Scots College Brighton Preparatory School for boys Kindergarten to Year 6. Goodness what an interesting history! It looks imposing as a school for little boys ...kind of scary! Lovely building. Glad to see it is still going strong. ...what a beautiful building, I can see wounded veterans sitting out on those wonderful porches. I love old sprawling places like that! If only the walls could talk. Thanks for the photo and info, too. So happy to see this building restored and being used. I have a photo of this same building given to me by my grandmother. On the back she had written "Tilly Saunders Guest House, she was a Gamfield and they lived near Yass" I thought this building must have been near Yass but found a few years ago it wasn't in Dolls Point and on the list to be demolished. So glad it wasn't. Tilly is Matilda Saunders nee Gamfield,she was a cousin of my grandmother Annie Norma Cripps nee Lymburner. I don't know if Matilda owned the house or if she worked in it. She married Gilford Saunders in 1895.